Finally, the perfect frame to display your K through 12 school pictures. 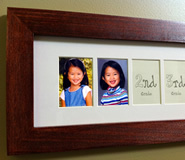 Watch your innocent little preschooler stubbornly morph into an independent young adult with this innovative and beautifully designed Kindergarten through 12th grade school picture frame. Purchase a limited edition wooden school picture frame on Etsy before they're gone! Dimensions: 38 3/8" x 8 5/8" x 3/4"
Watch your innocent little preschooler stubbornly morph into an independent young adult with this beautifully designed, handmade and limited availability K through 12 school picture frame. This well crafted school picture frame will provide you with decades of joy. From the moment you add your first school picture, it will be a treasured centerpiece of you home and an item of awe and envy for your houseguests. A few years ago, I designed and built the first version of this K through 12 school picture frame for my own daughter. Upon hanging it in my home, I immediately started fielding requests from friends and family for frames for their own children. After procrastinating for years, I have made a few more frames for my local and Etsy friends. Each frame is made out of beautiful, even grained solid radiata pine wood. The select pine boards are responsibly harvested from carefully managed New Zealand plantation forests and are milled to exacting standards. Each one comes finished in a hand rubbed mahogany stain with multiple clear coats of varnish. To maximize durability, all beveled corners are reinforced with side-mounted, flush-cut hardwood dowel pegs. Within the frame is a lightweight and durable acrylic pane, a custom bevel cut white mat board which fits thirteen standard 2 1/2 x 3 1/2 inch (6.4 x 8.9 cm) school pictures, a finely printed school year placeholder and time capsule on 20 lb cream colored paper, a hardboard back with seven turn buttons to allow for easy installation of new pictures, a securely fastened sawtooth hanger and four felt pads on each corner to prevent any wall scrapes. With this new batch of school picture frames, I have added a fun new feature: the secret time capsule. Every year, when you add a new school picture (the highlight of the school year for me), you can record some important milestones for your child like their height and weight, teacher's name, best friends, and favorite activities, books, movies and websites. I wish my original frame had this feature and info! I number and catalog each frame to insure a color and design match if you choose to order another frame when your family expands. Through and through, I am a builder, an uncompromising craftsman and a stickler for the smallest of details. Over the years I've filled my spare time by building furniture, picture frames, websites, decks, sheds...even a horse barn. From me, you can expect to receive projects which are innovative, well designed and well crafted. Thank you for visiting!